The California system. The other WCI system, Quebec , has very similar arrangements. The Regional Greenhouse Gas Initiative (RGGI) in the northeastern USA. An effective floor price can easily be introduced into an ETS by setting a reserve price in allowance auctions. This automatically leads to a reduced quantity of allowances being made available in the market if the price is below the reserve, because some allowances remain unsold, and there is thus a greater reduction in emissions compared with the original cap in the event of excess supply. Unsold allowances are typically held in a reserve for release in future. (A further design choice then needs to be made as to whether any unsold allowances are permanently removed, for example immediately or at the end of each phase of the system.) The reserve price is not an absolute floor, in that the price in the market can dip below it for a while, but if they remain there the reduction in supply from unsold allowances at auction is likely to restore the price quickly, assuming that a significant proportion of allowances are auctioned, as they are in each of the systems with reserve prices. An alternative approach to implementing a price floor is a tax that in effect tops up the carbon price when it’s below the floor. This may be done by adding the difference between the floor and allowances prices. This was the original intention of the UK’s carbon price support mechanisms, although this has now become a (very effective) fixed price simply added to the EUETS price. A top-up mechanism was also envisaged for international offsets under the Australian system, though not implemented. A price floor can create greater certainty for investors in low carbon technology, and greater stability for the system itself. Floor prices can also make for more stable government revenue, and for this reason alone they are likely to attract continuing attention from governments. However there is a risk with a reserve price that allowances will be unsold, and so reduce revenue. Such provisions could be extended to create a stepped floor by setting different reserve prices for different tranches of allowances. This would in effect offer a supply schedule into the market, representing different prices and quantities of abatement. Indeed something like this already exists in the California system where the effect of the price floor is supplemented by a soft ceiling in the form of a price containment reserve which is allocated in stages at successive price thresholds, and in this way seeks to limit the price of allowances. A new Emissions Containment Reserve (ECR) is planned is planned for RGGI from 2021, where 10% of allowances will be auctioned only if the price rises above a threshold of $6/tCO2, rising by 7% p.a.. This will give RGGI, like California, a stepped supply curve. Reserve prices resemble similar features in many types of auctions for different sorts of products, whether they are there to prevent, for example, your favourite Rembrandt selling for a few pounds, or your latest e-bay offering selling for a few pence. Under the California ETS (Quebec has very similar arrangements) there is an auction reserve price of $10/tonne in 2012, which rises at 5% p.a. plus an inflation adjustment, and was $14.53/tonne in 2018. Any allowances that are not sold at auction are retained by the regulator, the Air Resources Board (ARB), in an Auction Holding Account. The holding account allowances are not made available again through the auction until the price has exceeded the floor price for two consecutive quarterly auctions, and return is subject to a limit of 25% of the total allowances available at each regular quarterly auction. As a result, a surplus in the Auction Holding Account may take time to be drawn down. 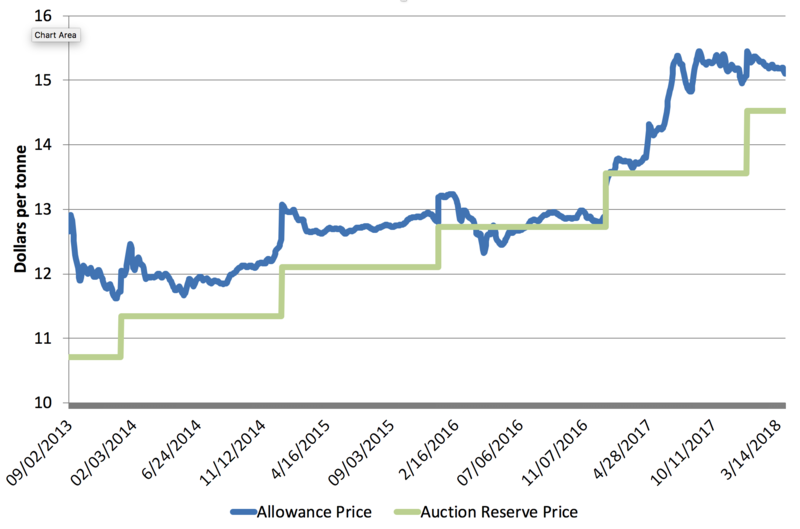 The price in the California system has stayed above the auction reserve apart from a period in 2016 where there was political and legal uncertainty about the future of the system (see chart). RGGI, which covers power sector emissions from several states in the north eastern USA, also includes an auction reserve price. However, the reserve price is much lower than in California, at $2.1/short ton in 2014 rising at 2.5% p.a., approximately in line with inflation. Allowances unsold at auction prior to 2014 are retained by the authorities and can be auctioned again, but allowances unsold at the end of each 3 year control period (the current control period is 2018-2020) may be retired permanently at the discretion of individual states. This gives a possible mechanism for automatically tightening the cap if there is a surplus allowances at the floor price over an extended period. The former Australian system also had a planned floor price, due to apply from the start of the floating price phase of the scheme in mid-2015, but although this was legislated it was not implemented as the scheme was repealed before this phase began. However it retained a fixed price until it was abolished, at an initial level of AU$23/tCO2, escalated at 5% p.a. nominal for the first three years of the scheme. Price ceilings for an emissions trading scheme operate by making additional allowance supply available. Ceilings can be absolute, or “hard” with unlimited additional supply available, or they can be “soft”, with limited amounts of additional supply available, so the price can rise above the ceiling if the demand is sufficiently strong. In California there is an Allowance Price Containment Reserve (APCR) from which successive additional tranches of allowances are released at prices of $40, $45, and $50/tonne in 2013, rising at 5% p.a. plus inflation thereafter. The thresholds have reached approximately $58, $66 and $73/tCO2 in 2019. This is entirely separate from the Auction Holding Account used for the floor. Allowances are sold from the APCR on a quarterly basis if there is demand. The sale is held six weeks after the regular quarterly auction of allowances, allowing buyers to make up a shortfall after the auction. Buyers specify the number of allowances they want at any of the three fixed prices. When the scheme began 122 million allowances were scheduled put into the APCR for the period to 2020, equal to 4.5% of the overall cap across all years (including the maximum allowed offsets), and relative to a single year (2015) is 29% of the cap including the maximum allowed offsets. The APCR allowances are taken from within each year’s capped total. The reserve is divided equally among the three price tiers. After 2020 it appears that there will be a further safety valve with additional offsets being allowed in the event of very high prices. The ceiling will thus move from being a soft ceiling with prices able to increase above a specified level, to a harder ceiling (likely at a different level) which prices will not exceed. This provision potentially somewhat weakens the environmental integrity of the cap but at present appears unlikely to be triggered in practice. RGGI also has a costs containment reserve (CCR) of additional allowances that can be released into the auction when the auction clearing price crosses a certain threshold. As with the floor the prices at which allowances are released are much lower than in California, being $4/short ton in 2014 rising at $2/short ton p.a. to reach $10/short ton in 2017, escalating at 2.5% p.a. thereafter. The CCR allowances are in addition to the cap, and balances are re-set annually to 10 million tons (which is just over 10 percent of the 2014 cap of 91 million tons plus allowable offsets of 3% of the total) if allowances are drawn down from the CCR. Under RGGI it is intended that from 2021 the CCR will have a trigger price of $13/tCO2 rising at 7% p.a.. The UK offers an example of a different approach, with a tax being used to set the floor price. The carbon price for fuels used in power generation in the UK consists of two components. The first is the price of allowances (EUAs) under the EUETS. The second is the UK’s own carbon tax for the power sector, known as Carbon Price Support (CPS). The Chart below shows how the level of CPS (green bars on the chart) increased over the period 2013 to 2017[i]. These increases led to a total price – that is the CPS plus the price of EUAs under the EUETS (grey bars on the chart) – increasing, despite the price of EUAs remaining weak over this period. The price floor is set by the level of the tax, as this would remain even if the EUA price fell to zero. This increase has had a dramatic effect on emissions from coal plant, which have reduced by more than 80%, over 100 million tonnes p.a., over the period (black line on chart). Various factors contributed to this reduction, including the planned closure of some plants and the effects of regulation of other pollutants. Nevertheless, the increase in the carbon price since 2014 has played a crucial role. Analysis has shown the increase in the carbon price accounted for three quarters of the total reduction in emissions due to generation from coal achieved by 2016[ii]. This has been achieved by a price which remains moderate against a range of markers, including other carbon taxes. The trend continued in 2018 (not shown on the chart) as generation from coal fell a further 25%, while total carbon prices were higher as the EUA price rose strongly. The net fall in emissions over the period (shown as the dashed blue line on chart) was smaller, at around 62 million tonnes p.a. [iii] This is because generation from coal was largely displaced by generation from gas. The attribution of three quarters of this 62 million tonnes as due to carbon price support implies nearly 47 million tonnes p.a. of net emission reductions due to the carbon price. This is equivalent to a reduction of more than 10% of total UK GHGs. The UK tax has thus proved highly effective in reducing emissions. The tax has now set at a fixed level of £18/tonne. It was previously set around two years in advance, targeting a total price comprising the tax plus the EUA price. There was no guarantee that it would set a true floor price, as EUA prices could and did change a good deal in the interim. Indeed, in 2013 support was set at £4.94/tCO2, reflecting previous expectations of higher EUA prices, leading to prices well below the original target for the year of £16/tCO2 in 2009 prices (around £17.70 in 2013 prices). In this respect the original proposal for a rebateable tax seems a superior design. The tax would have been charged at the level of the floor price but the out-turn EUA price for the year could have been used to set a rebate on the tax, thus creating a floor at the level of the tax irrespective of where the EUA price ended up. [iii]. Other systems have some form of partial price containment. The Alberta Specified Gas Emitters Regulation (SGER), which ran for approximately ten years until the start of 2018, imposed a hard ceiling by allowing emitters to pay into a fund at a specified price rather than surrender allowances. [iii] Based on UK coal generation estimated weighted average emissions intensity of 880gCO2/kWh, and 350gCO2/kWh for gas generation. [iv] There is a standard objection to a floor in one country under the EUETS is that it does not change of the overall cap at an EU level so, it is said, does not decrease emissions. However this does not hold under the present conditions of the EUETS, and is unlikely to do so in any case. 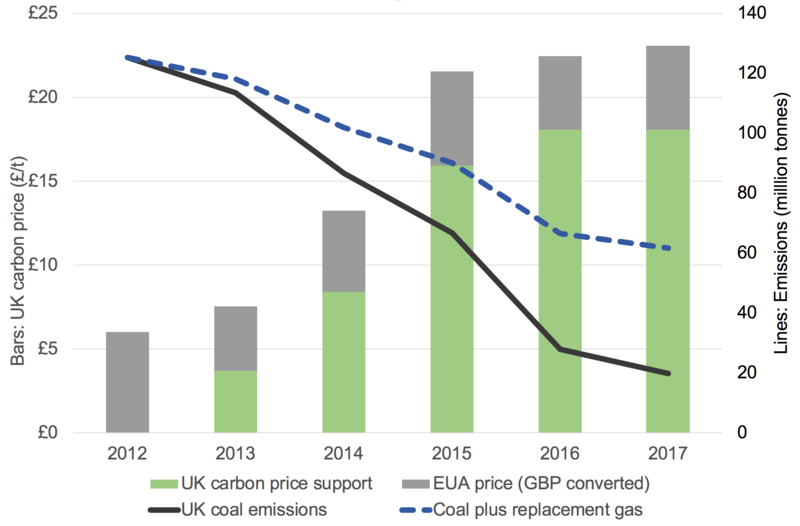 A review of how emissions reductions from national measures, such as the UK carbon price floor, do in fact reduce total cumulative emissions over time is provided was provided in my post here.